It's close to the end of October already! Wow! For so many reasons this is my favorite time of year. The brisk, refreshing weather after a long hot summer rank at the top of the list, but so do the bounty of holidays to celebrate before we welcome in a new year! We couldn't think of a better way to welcome everybody to our blog than by giving you some free crochet patterns just in time for Halloween! Today we have our candy corn, spider and basket of pumpkins patterns for you to enjoy but don’t forget to check back occasionally as there is more to come. GAUGE: Exact gauge is not essential to this project. sc2tog (sc 2 sts together) Insert hook into st and draw up a loop. Insert hook into next st and draw up a loop. Yarn over, draw through all 3 loops on hook - 1 st decreased. NOTES: Body is worked in continuous rnds; do not join and do not turn at beg of rnds. A marker is used to indicate the beg of rnd. Move marker up as each rnd is completed. Place marker in first st for beg of rnd; move marker up as each rnd is completed. Rnd 2: Work 2 sc in each sc around - 12 sc at the end of this rnd. Rnd 3: *2 sc in next sc, sc in next sc; rep from * around - 18 sc at the end of this rnd. Rnd 4: *2 sc in next sc, sc in next 2 sc; rep from * around - 24 sc at the end of this rnd. Rnds 5-10: Sc in each sc around. Rnd 11: *Sc2tog, sc in next 2 sc; rep from * around - 18 sc at the end of this rnd. Begin to stuff piece and continue to stuff until piece is complete. Rnd 12: *Sc2tog, sc in next sc; rep from * around - 12 sc at the end of this rnd. Rnd 13: (Sc2tog) 6 times - 6 sc at the end of this rnd. Weave tail through sts of last rnd and pull gently to close opening. Row 1: Work 2 sc in 2nd ch from hook, sc in next 3 ch, (sc2tog) twice, sc in last 2 ch - 9 sc. Fasten off leaving a long tail for sewing Leg to Body. Sew Legs to Body. With scrap of grey yarn, embroider French knot eyes and straight st mouth on face. 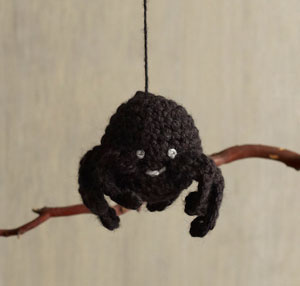 Cut a 3"/7.5cm length of yarn, fold in half to form a loop and tie to top of Spider for hanging loop. Each Pumpkin is 3 1/2" across. With C hook and size 3 crochet cotton, 6 sc = 1"; 6 sc back lp rows = 1". With I hook and worsted-weight yarn, 3 sc = 1"; 7 sc rows = 2". Row 1: With I hook and orange, ch 11, sc in 2nd ch from hook, sc in each ch across, turn (10 sc). Rows 2-30: Ch 1, sc in each st across, turn. At end of last row, leaving long end for sewing, fasten off. Matching sts, sew first and last rows together, weave through ends of rows, pull to gather; secure. Rnd 31: Working in ends of rows across opposite edge, join orange with sl st in first row, ch 1, sc same row and next row tog, (sc next 2 rows tog) around, stuffing before closing, join with sl st in first sc. Leaving long end for gathering, fasten off. Weave end through rnd 31, pull togather, draw end through top center to bottom center of Pumpkin make small st and draw back to top pulling tightly to form indentation; secure. Row 1: With C hook and green, ch 7, sc in 2nd ch from hook, sc in each ch across, turn (6 sc). Rows 2-8: Working these rows in back lps only, ch 1, sc in each st across, turn. Row 9: Holding first and last rows together, matching sts, working through both thicknesses, ch 1, sl st in each st across, do not turn. Rnd 10: Working in ends of rows, ch 1, 2 sc in each row around, join with sl st in first sc. Leaving long end for sewing, fasten off. Sew back lps of sts on last rnd to top center of Pumpkin over indentation. Fill basket almost full with raffia. Insert one sprig of harvest bouquet on each side. 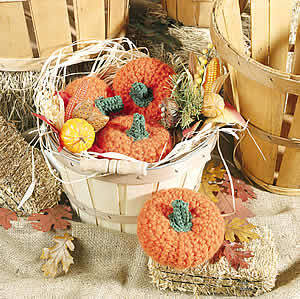 Fill with Pumpkins. Finished Size: Approximately 41⁄2” (11.4cm) tall. Crochet Hook: Size E-4 US (3.5mm). • Color C (White) 6yd (5.5m). • Yarn or tapestry needle; embroidery needle. INVDEC: Invisible decrease: Insert the hook through the front loop of st and then through the front loop of the next st. Yarn over and pull yarn through both front loops. Yarn over and pull through both loops on hook. SC2TOG: Single crochet two together. Candy corn is worked in a continuous spiral. Do not join rnds. You may wish to use a stitch marker to mark the beginning of a rnd. Starting at bottom of candy corn with E-4/3.5mm hook and COLOR A, ch 11. Rnd 13: Sc in each sc around. Rnd 17: Sc in each sc around. Rnd 19: Sc in each sc around. Stuff candy corn firmly. Cut yarn leaving 8”/20cm tail. Using a tapestry needle, insert needle through loop of each stitch and pull tight to close hole. Weave in end. 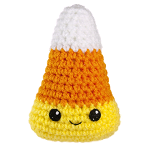 To make a standing candy corn, make an indent at the bottom of the candy corn by drawing a loop of yarn through the bottom center and pulling up through the middle of the candy corn and securing. Have a Happy Halloween and Enjoy!! !